Power Factor Correction (PFC) is the key to mitigating power quality issues because more reactive sources will Connected to the grid. This article describes the effect of power factor on power efficiency. In an AC system, the Digital PFC controller performs a proper power factor improvement with low loss by detecting the inductor current. Low power factor usually means poor input current quality and low efficiency, which will impose a cost burden on suppliers and consumers. In AC systems, the low power factor is usually derived from the distortion of the input current waveform, which is why some international electrical standards have strict limits on the harmonic content of the current, and why in some cases, active  or none Source power factor correction is almost mandatory. 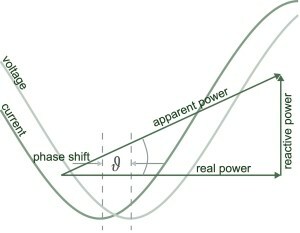 In a sinusoidal AC system, the power factor is between the effective power and the total power consumption (apparent power) The relationship is the ratio of the effective power divided by the total power consumption (apparent power), including the active power and reactive power caused by the reactive power generated by the electric and magnetic fields generated by the load. The reactive impedance makes the current waveform The hysteresis voltage waveform is called the phase shift angle. Therefore, we can express the power factor as the cosine of the phase shift angle between the voltage waveform and the current waveform. It is concluded that the power factor is close when the phase shift angle of the current waveform and the voltage waveform approaches zero. The maximum value of 1. In an actual AC power supply, the input current is usually a complex signal containing multiple harmonic components, when the main harmonic or fundamental wave [ 2] (In phase with the circuit voltage) When providing real power, other harmonics carry a large amount of unusable energy. So, in the actual system , the power factor is derived from the distortion factor,The distortion factor is based on the sum of all additional harmonics on the primitive, or the total harmonic distortion rate (THD). Therefore, the role of the PFC converter is to passively adjust or actively reconstruct the input AC waveform so that it is more closely aligned with the voltage signal in phase and shape, and to avoid unnecessary harmonics. power factor The correction is based on switching devices (MOSFETs, IGBTs, etc.) that form the input average current waveform by quickly switching the PFC inductor current. The PFC controller determines the breaking time of the switching device by comparing the circuit feedback and the reference signal to charge and discharge the corresponding PFC inductor. Through the oscillation of the instantaneous current of the PFC inductor, a small net increase or decrease is generated in the average inductor current, and the PFC controller controls these currents to produce the desired sinusoidal waveform. In high-power applications, it is usually best to divide the PFC level into two or more parallel PFC circuits. This process is called interleaving. Although interleaving increases the number of circuit components, the lower current and switching frequency in each channel allows better overall power and thermal management, improves efficiency, and because the required inductor is much smaller, actually Can reduce costs. Because the PFC controller can generate separate PWM outputs to drive each phase channel, it can be heavy The firmware on these controllers will always include phase-cut logic to limit the number of channels used when power requirements are relatively low. With the development of digital converters for modern converters, embedded functions continue to increase, replacing Complex analog circuitry for greater flexibility and scope of operation. Another key advantage is the programmable and configurable firmware residing on these controllers, which provides solution designers with the ability to implement themselves Logic algorithms and set application-specific parameters to keep the converter consistent with specific design requirements. The new STNRGPF01 is capable of managing loads up to 3 kW from any standard international input supply voltage. The controller enables full power and load monitoring, high responsive performance and safety management, and Achieve 3-channel crossover, significantly improving the overall efficiency of the converter, reducing the cost and size of the main inductor, while in high-power applications, the cost and size of the main inductor can be quite expensive. Another product line - STNRGPF12 can pass double Channel crossover manages loads up to 2 kW and has digital inrush current control to better manage the startup phase when current spikes can damage circuit components. STMicroelectronics STEVAL-IPFC01V1 PFC kit based on STNRGPF01 number Controller with separate power board, control board and adapter board. STNRGPF01 is a digital configurable ASIC that drives up to three channels in interleaved PFC for industrial applications. STNRGPF01 is designed to meet IEC 61000-3-2 Electrical Equipment Standards. In fact, both STEVAL-IPFC01V1 and the latest STEVAL-IPFC12V1 use analog sensing components and comparators that can transmit instantaneous waveform information. Direct feedback to the STNRG digital controller for cycle-by-cycle current regulation, even at very high frequencies in switching circuits. Finally, ST also provided an excellent design tool called eDesignSuite, which includes a section for PFC converters that can really help engineers improve their productivity during the design phase. The software not only develops a complete solution, but also generates custom firmware based on your design parameters and bill of materials and schematics, and uploads it to your STNRG digital PFC controller to meet specific application requirements. Common active power factor correction circuits are classified into continuous current mode control type and discontinuous current mode control type. Among them, the continuous current mode control type mainly includes a boost type (Boost), a buck type (Buck), and a buck-boost type (Buck-Boost); the discontinuous current mode control type has a forward type (Forward) and a reverse type. Fly back. Harmonics refers to the components of the quadratic series that are obtained by Fourier series decomposition of periodic non-sinusoidal quantities, which are more than integer multiples of the fundamental frequency. wave,The fundamental wave is the same component whose frequency is the same as the power frequency (50 Hz). High-order harmonic interference is a major "public hazard" affecting power quality in current power systems, and countermeasures are urgently needed.